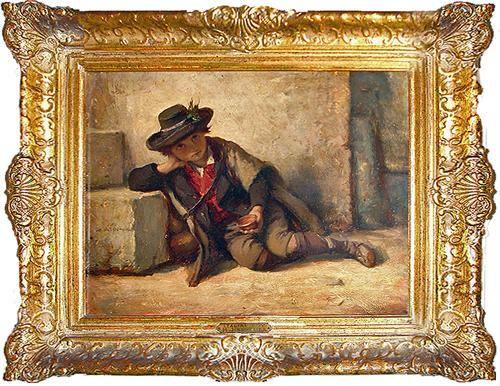 The 19th Century Oil on Panel, The Italian Boy by Hubert von Herkomer - C. Mariani Antiques, Restoration & Custom, San Francisco, CA. The 19th Century Oil on Panel, The Italian Boy by Hubert von Herkomer, the German born British Social Realist Painter who studied at Southampton School of Art, the Munich Academy and the South Kensington Art School. Although von Herkomer received large sums of money for his portraits, he continued to produce social realist paintings like this one and Pressing to the West (1884), Hard Times (1885) and On Strike (1891). Von Herkomer was knighted in 1907 and died in 1914. His work is represented in the National Portrait Gallery in London. Height 13 1/2"; Width 16"